“It won’t—” he began, then hes­i­tat­ed, “I mean, the cuts are not deep. 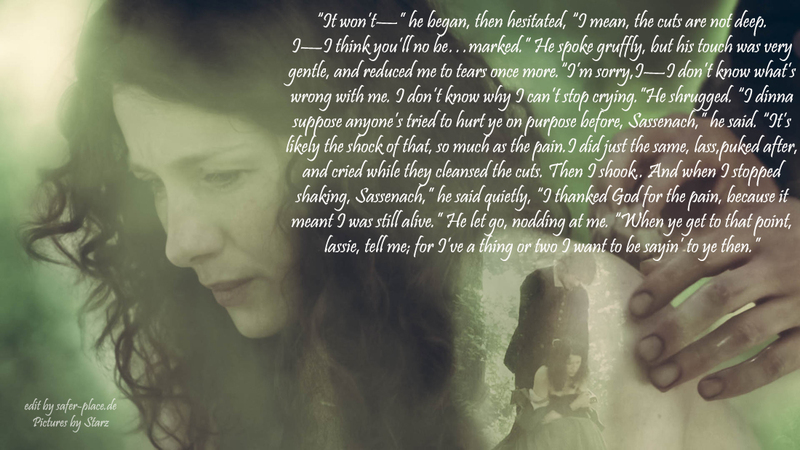 I—I think you’ll no be…marked.”He spoke gruffly, but his touch was very gen­tle, and reduced me to tears once more. He shrugged. “I din­na sup­pose anyone’s tried to hurt ye on pur­pose before, Sasse­nach,” he said. “It’s like­ly the shock of that, so much as the pain.” He paused, pick­ing up a plaid-end. “I did just the same, lass,” he said mat­ter-of-fact­ly. “Puked after, and cried while they cleansed the cuts. Then I shook.” He wiped my face care­ful­ly with the plaid, then put a hand under my chin and tilt­ed my face up to his.